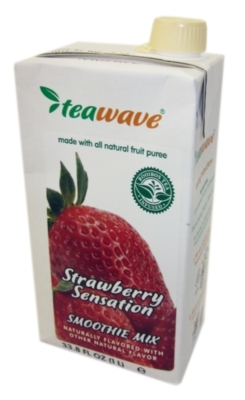 TeaWave premium smoothie purees are made of only the highest quality fruit and antioxidant-rich Rooibos (red) tea to make a delicious and refreshing fruit smoothie. TeaWave fruit smoothies are simple to make - just add ice, blend, and enjoy! 30% off Teawave Ends Friday, March 21, while supplies last. As an alternative option, please try Jet's Real Fruit Smoothies; with direct flavor matches for Peach, Mango, Sour Green Apple, Strawberry, Strawberry Banana, Wildberry, and Orange and additional flavor options as well!